Cherry (1) (さくらんぼ(1房), Sakuranbo (hitofusa)?) ?? Cherry (2) (さくらんぼ(2房), Sakuranbo (futafusa)?) ?? A large Chestnut that is used for a JapanMS summer to fall event. ?? An enormous Chestnut used for the JapanMS summer to fall event. ?? Maple Fruit (メイプル果実, Meipuru Kajitsu?) ?? Maple Fruit (Big) (メイプル果実(大), Meipuru Kajitsu (Dai)?) ?? A Red Gourd, similar to the one summoned in Korean Folk Town. ?? A Watermelon box monster. It spawns in many random locations on Victoria Island and Zipangu. When defeated, the Evil Watermelon emerges. ?? A strange Evil Watermelon monster. It has very high Defense, so it doesn't need that much HP. Once the Watermelon is defeated, it drops seeds that are needed for a quest. ?? Summoned by an item for the Moon Festival. It dies automatically after a few seconds. ?? A golden egg with a very hard shell, filled with many rare prizes. ?? A peach summoned from a seed like gourd. This was from a recent JapanMS event. When 1,000 squishy liquids were collected, they could be exchanged for a seed. When killed it drops loads of items. One of the most popular drops was an Alishar summoning bag. ?? 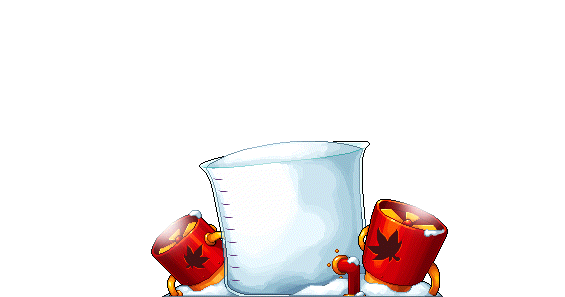 For MapleSEA special "School Term Break Event" in September to gain 70% ATT. scroll of your choice. Recently appearing in a similar event for ThailandMS. ?? A Slime that got into the Oktoberfest Beer Tent and somehow got drunk off the Non-alcoholic beer stored there. It looks like a Slime with red face with spinning eyes. ?? A Ribbon Pig that got into the Oktoberfest Beer Tent and somehow got drunk off the Non-alcoholic beer stored there. Looks like a Ribbon Pig with a red face and spinning eyes(Standing only). ?? A monster in the TWMS's Anniversary maps. There is a lot of cakes and cakes monsters in maps. It can only be harmed by normal attacks. Based off of GMS' Cake Monster. ?? Native to Coke land, the Snails have adapted by using the coke logo on their shells. Found in KoreaMS's Coca-Cola World. ?? A special Pigmy that drops golden eggs when defeated. Must hunt these while avoiding the Bam Bam Cats. ?? 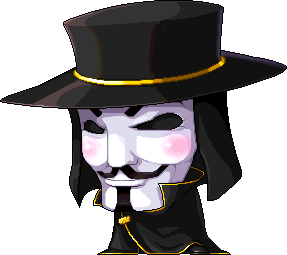 An enormous Guy Fawkes, which appears inside the Guy Fawkes Party Quest, an event quest available in November, as a boss. ?? A small snowman. No matter your damage, you will always hit 10 on this. It is stationary. It seems to be unrelated to the larger ones. ?? A Rudolph that once lived with Santa, but for some reason ran away. Looks suspiciously similar to the Reindeer of Mu Lung. No matter your damage, you will always hit 5 on this. ?? A small ghost that roams the Haunted Mansion in the Uninvited Guest Party Quest. Must be captured after it is weakened with regular skills by using a special pouch given to the player by Butler/Steward. These were also reused in a ChinaMS event, where they were summoned in town, this time capable of flight. ?? Capable of doing light-medium damage and dropped Birthday Candles/Birthday Presents, which may be commonly dropped or hardly ever, depending on how lucky the player is. This monster was very commonly found in lower-level areas such as the areas between Victoria Island towns. Purely for quest reasons, it gives no EXP or mesos. Removed as of GlobalMS Version .24, and reimplemented as part of Amoria premium weddings as of version .32 ?? This is the new version of the candle monster, for the second anniversary. Much weaker than the previous year's, and it gives EXP. ?? A huge tomato made for Spain's La Tomatina event for EuropeMS. Can heal 2000 HP every 10 seconds. ?? An elf dressed in Blue clothes, carrying a lollipop. One of the 3 Partycrashers which try to ruin the 1st anniversary party. Can only be defeated by throwing cakes at them. All other attacks will miss this elf. A Hermit can throw 2 cakes using its Shadow Partner. One defeated, it drops multiple cakes and several coupons, which can be exchanged with a random given candy. ?? An elf dressed in green clothes, carrying a Hammer. One of the 3 Partycrashers which try to ruin the 1st anniversary party. Can only be defeated by throwing cakes at them. All other attacks will miss this elf. A Hermit can throw 2 cakes using its Shadow Partner. One defeated, it drops multiple cakes and several coupons, which can be exchanged with a random given candy. ?? An elf dressed in red clothes, carrying something. One of the 3 Partycrashers which try to ruin the 1st anniversary party. Can only be defeated by throwing cakes at them. All other attacks will miss this elf. A Hermit can throw 2 cakes using its Shadow Partner. One defeated, it drops multiple cakes and several coupons, which can be exchanged with a random given candy. ?? A flying book monster that seems to come off the shelves. In other versions, these are invincible obstacles. No matter your damage, you will always hit 999 on this. ?? A Jack in the Box that hasn't been opened. In other versions, they are much stronger, but in KoreaMS they were heavily nerfed. No matter your damage, you will always hit 999 on this. Revives into Toy Clown. ?? A Green Ghost that appears in the Haunted Mansion. It looks the same as the grounded version from GlobalMS, but this one is of a lower level. No matter your damage, you will always hit 999 on this. ?? A small ghost that roams the Haunted Mansion alongside the Green Phantom. This one isn't found in other versions of the mansion. These were also reused in a ChinaMS event where they were summoned in town, this time capable of flight. No matter your damage, you will always hit 999 on this. ?? These dolls are based on the concept of Voodoo. In other versions, they are much stronger, but in KoreaMS they were heavily nerfed. No matter your damage, you will always hit 999 on this. ?? These dolls are based on the concept of Hoodoo. In other versions, they are much stronger, but in KoreaMS they were heavily nerfed. No matter your damage, you will always hit 999 on this. ?? A Jack-o-Lantern that has donned a witch hat. They are summoned as the player carves a face into the Giant Pumpkin in a special map accessed from the Haunted Mansion. Once the face is completed, stronger versions will appear that cannot be hit by skills, only regular attacks. ?? This is the cake monster for GlobalMS's third anniversary event. It's much larger than the previous cake monsters, and comes in chocolate this year! ?? A monster that appeared in hunting grounds during several anniversary events. No mater how strong the character is, the damage inflicted is always 99,999. Disappears if not defeated in 10 minutes. ?? A slightly stronger bubbling located in KMS's Coke Town. Its liquid body seems have coke mixed into it giving it Coke's color, which is brown. ?? A monster that is summoned via a Dong Dong Chiang summoning bag during the Lunar New Year event in VietnamMS. When defeated, Dong Dong Chiang drops multiple etc. 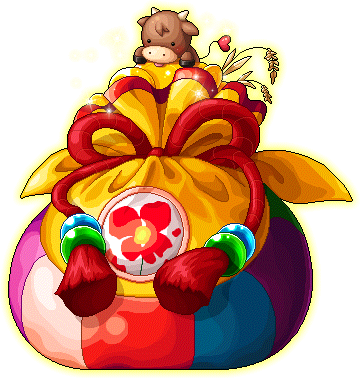 drop items, as well as "Bao lì xì" (Hongbaos, or Red Envelopes), two of which can be given to the Maple Administrator to exchange for 100 "Bánh Chưng", a food item that allows for a recovery of 500 HP and MP. ?? 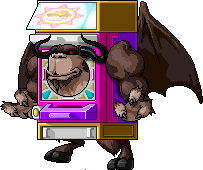 Pachi Balrog (パチバルログ, Pachi Barurogu?) ?? A yellow stomp rabbit that spawns in several maps, notable Zipangu, El Nath, and Taipei. 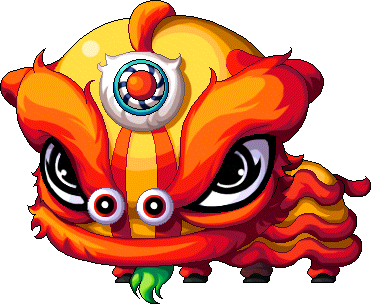 Used in a Moon Festival event. ?? A Blue Mushroom that got into the Oktoberfest Beer Tent and somehow got drunk off the Non-alcoholic beer stored there. It looks like a Blue Mushroom with red face and closed eyes. ?? A Jack in the Box that hasn't been opened. In other versions, they are much stronger, but in KoreaMS they were heavily nerfed. This is another variety, with less HP, but takes 10 damage all the time. Revives into Toy Clown. ?? A toy clown that came out of his box. In other versions, they are much stronger, but in KoreaMS they were heavily nerfed. No matter what your damage is, you will always hit 999 on it. ?? A terrible rocking horse from a bad dream. In other versions, they are much stronger, but in KoreaMS they were heavily nerfed. No matter what your damage is, you will always hit 999 on it. ?? This is the pathetically weak counterpart to the other versions' Headless Horseman boss. No matter your damage, you will always hit 999 on it. ?? A snowman that's unrelated to Snowman1. No matter your damage, you will always deal 10 damage to it. When this form is defeated, it grows into the even larger Angry Snowman. ?? King Slime's decoy. Fake King Slime is found in various places around Victoria Island. Unlike the real King Slime, it cannot summon normal Slimes, but it can raise its attack, not that it helps. ?? A strange mushroom, whose cap has been replaced by a Coke Bottle's lid as a result of living in Coke land. Located in KoreaMS's Coke Town. An invincible ghost that appears in the Haunted Mansion to hurt players. A yellow egg monster with a very hard egg shell that appeared as part of the Easter events in 2007. Features a kicking magic attack and drops various items, which is unique for an event monster. A candle monster that was found in Sweet Cake Hill the first year it was released. It was replaced with the Little Pie Monster. A crazed person who seeks to destroy Happyville and Christmas altogether. Has a disturbing resemblance to the friendly O-Pongo, 2007's Versalmas mascot, albeit much thinner and angrier. It can recover around 1,000 HP, but it doesn't appear to be much of a threat. Serves as the boss of the Christmas Party Quest's easy mode. An Evil Eye that got into the Oktoberfest Beer Tent and somehow got drunk off the Non-alcoholic beer stored there. Looks like an Evil Eye except that it has a red face. A monster in the Coke World, it looks like a creature wearing a Coke can. It's a Coke version of a stump even if it doesn't look much like one. A cake monster that was found in Sweet Cake Hill. 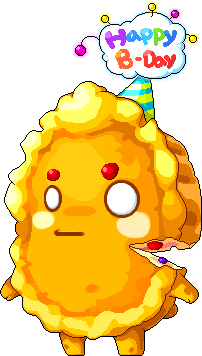 A pie monster that was found in Sweet Cake Hill during the Cake vs. Pie events. Only in the game near the American Thanksgiving. It drops various Thanksgiving related items such as Roasted Turkey, Corn, Pilgrim Hats, and Chief Axes. A Jr. Wraith with a festive Santa hat on, which directly contrasts with its typically spooky image. This is the mid-strength form, and it appears in the "Normal" version of the Christmas Party Quest in Happyville. A Stirge with a festive Santa hat on. This is the mid-strength form, and it appears in the "Normal" version of the Christmas Party Quest in Happyville. This is the Cake Monster for GlobalMS's Second Anniversary. Strong against Ice and Weak against Poison. It's 2nd layer compared to the first cake symbolizes the 2nd year for Maplestory. A stronger version of the regular Coketump. It is a Coketump wearing a white Coke can(Exclusive to Coca-Cola Light/Diet Coke) instead of a red Coke can. This is the cake monster for MapleSEA's third anniversary event. It's much larger than the previous cake monsters, and comes in chocolate this year! This version has more HP and is a higher level than the Anniversary Cake from GlobalMS. The stats appear to be identical to those of Fake Jr. Balrog. Capable of doing medium-high damage and drops Birthday Candles/Birthday Presents, quest items that are a rare drop. These monsters are very commonly found in higher-level areas such as Sleepywood and Ossyria/Ludibrium. Purely for quest reasons, as it gives no EXP, or mesos. Takes a longer time to recover from knockback when hit (about 1.5 seconds, rather than instantly with most other monsters), so timing hits slows this monster's progression toward a player. Now implemented again inside of the Amoria Untamed Hearts Hunting Ground, accessible only through a premium wedding. Jr. Balrog's decoy. Has the same attacks as the real Jr. Balrog, but much, much weaker. It can also raise its weapon attack, but it doesn't help that much. Found in a few places in Sleepywood. Interestingly enough, the Fake Jr. Balrog has resurfaced in the Pumpkin Vault, a secret area of the Haunted House in Masteria. They spawned in the eyes of the pumpkin every hour for the Halloween Event. The young girl of the family that moved into the Prendergast Mansion in 2009. Fought as part of a PQ at the end of Haunted House II quest chain. She can cause darkness, rain down pictures all over the map, summon possessed toys, Zombify you and uncommonly do 1/1. She drops cursed dolls that can be traded in for a chair resembling this possessed form. 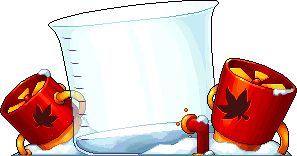 Randall is inside this robot, and must be defeated in order to complete a mission to correct the past in Stage 4. Involved in the Cake vs. Pie event. Only available during the "Visitors" event. Spawns after the first form of the Ultimate Visitor is defeated. A Lupin that got into the Oktoberfest Beer Tent and somehow got drunk off the Non-alcoholic beer stored there. Looks like a Lupin with red cheeks and closed eyes. A strangely dressed pig with the ability to walk upright, unlike other pigs. It seems to be summoned from a special golden Summoning bag with the ability to change monsters into Area Bosses. Lupin Pig only appears from these sacks at a low rate (1%) so consider yourself lucky to see one! A Flyeye with a festive Santa hat on, which looks rather odd perched atop its eerie single eye. This is the mid-strength form, and it appears in the "Normal" version of the Christmas Party Quest in Happyville. A brown pig with a coke ribbon. Found in KMS's Coke Town. A green egg with a very hard egg shell that appeared as part of the Easter events in 2007. It has a kicking magic attack that it uses without provocation. They also have a tendency to form mobs and drop various items, which is unusual for event monsters. A monster to hinder player in the TWMS's Anniversary maps. There are many cakes and cake monsters in these maps. If you touch this monster you will be withdrawn from the map. A Hogul guarding the watermelon patch. Available as part of the Find Master M quest, "Agent W's Watermelon Investigation". Moves faster than a normal Hogul. This monster spawns after a Frog is defeated. Part of occasional GlobalMS Halloween Events. Upon defeat, it drops 20 Cursed Frog Eggs, (used in Witch Malady's exchange quest). This monster spawns after a Black Cat is defeated. Part of occasional GlobalMS Halloween Events. Upon defeat, it drops 20 Cursed Cat Spittle (used in Witch Malady's exchange quest). A seal, like those in Aqua Road, with a Coke theme. The "Play" symbol can be seen on its chest. It is light in color. It has an attack by glowing the symbol. Found in KMS's Coke Town. A monster in the TWMS's Anniversary maps. There is a lot of cakes and cake monsters in maps. It can only be harmed by normal attacks. It is based off of GMS' Cake Monster. During TaiwanMS's Christmas event, a Christmas king slime randomly appeared in Formosa (implemented in TaiwanMS patch version .43). An even larger snowman that's also become mad. No matter your damage, you will always hit 10 on this. 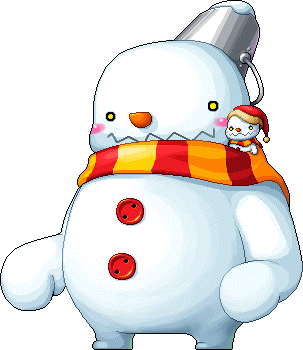 When this form is defeated, it grows into the even larger Giant Snowman. A fake version of Snack Bar, the boss of Night Market (and the Drake Cave in some versions). A small Jack O Lantern from JapanMS. A larger Jack O Lantern from JapanMS. A pie monster that was found in Sweet Cake Hill. A stronger version of the Coke Seal, with a brown skin and a Coke cap on the head. Note the Power On/Off symbol on its chest, called the "Play" Symbol. It is slower than Coke Seals, and has the same attacks. The animation frames are slower than Coke Seals. Located in Coca Cola World. Papa Pixie's decoy. Has many of the same attacks as the real Papa Pixie, but they are very weak. Like the other Fake Bosses, it can raise its weapon attack. Fake Papa Pixie is found on various maps in Orbis. A Tortie with an igloo for a shell, and, unlike its original form in Florina Beach, cream colored skin. Perfect for beginner Fire/Poison Mages, as it takes only a couple hits to kill. It's best to avoid its ice attack as it can freeze you for several seconds. Located in KMS's infamous Coke Town. A candle monster that was found in Sweet Cake Hill the first year it was released. It was replaced with the Pie Monster. A crazed person who seeks to destroy Happyville and Christmas altogether. Has a disturbing resemblance to the friendly O-Pongo, 2007's Versalmas mascot, albeit much thinner and angrier. It can seal, but it doesn't appear to be much of a threat. Serves as the boss of the Christmas Party Quest's Normal mode. A brown golem with snow covered in it instead of grass. The core shows the "Play" symbol instead of the symbol that Stone Golems use. One of the stronger monsters in KMS's Coke Town. A red egg with a very hard egg shell that appeared as part of the Easter events in 2007. It has a kicking magic attack that it uses without provocation. They also have a tendency to form mobs and drop various items, which is unusual for event monsters. An enormous stocking that spawns in towns during the Christmas events of 2008. It has low damage, but it can still be dangerous to people who aren't at their computers when it spawns, rendering the main town area unsafe. Take note that the drops don't have ownership, so anyone can loot them regardless of whether they scored the most damage. One can tell that it is a Pachinko Machine from JMS if you look closely. Only summoned in special GM events and drops one rare item each time its hit. It's concealing a machine gun and helicopter blades in there. An even larger snowman that's also become mad. It can only be attacked with normal attacks, and no matter your damage range, you will always hit 10 on it. When this form is defeated, it grows into the even larger Snowman3. The Young girl of the family that moved into the Pendergast Mansion in 2009. Fought as part of a PQ at the end of Haunted House II quest chain. She can cause darkness, rain down pictures all over the map, summon possessed dolls, Zombify you and uncommonly do 1/1. She drops cursed dolls that can be traded in for a chair resembling this possessed form. Crimson Balrog's decoy. Found in various El Nath maps, it flies just like the real thing, making it annoying to kill. 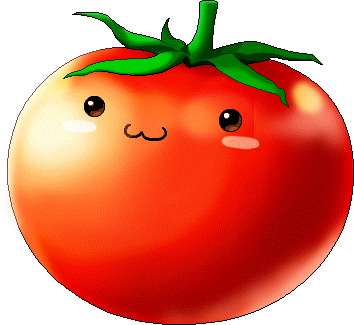 Like the other Fake Bosses, it's weak and it can raise its attack in a futile attempt to kill people. Alishar's decoy. Has the same magic attack as the real one, but obviously is much weaker. Unlike the real Alishar, it cannot summon Chronos. Fake Alishar is found in various Ludibrium maps. A large goldfish that can be summoned through the sacks earned during the event. A fake version of the Giant Centipede, the boss of Shanghai Waitan (and Herb Town in some versions). A Jr. Wraith with a festive Santa hat on, which directly contrasts with its typically spooky image. This is the strongest form, and it appears in the "Hard" version of the Christmas Party Quest in Happyville. A Stirge with a festive Santa hat on. This is the strongest form, and it appears in the "Hard" version of the Christmas Party Quest in Happyville. 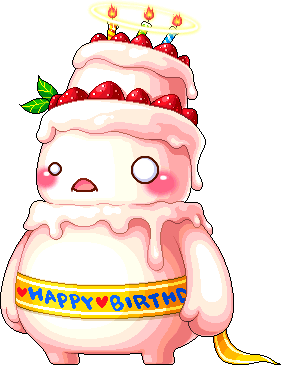 A cake monster that was found in Sweet Cake Hill the first year it was released. It was replaced with the Giant Pie. A fake version of Lord Pirate, the boss of Herb Town's Pirate Party Quest. Found in various Mu Lung and Herb Town maps. Blue Mushmom's decoy. It is by far the rarest Fake Boss, appearing in only two Zipangu maps. Like the real Blue Mushmom, it can stomp the ground, though it's obviously weaker than the normal version. This is the fake version of Amoria PQ's Geist Balrog. Found in KMS's Coke Town. It looks like a Coke Golem but the blocks are light blue instead of brown. Due to the fact that it is made of ice, it is very weak against fire attacks. The biggest snowman of all. It can only be attacked with normal attacks, and no matter your damage, you will always hit 10 on it. When defeated, it transforms back into a Little Snowman and melts, exploding in a flurry of Christmas gift boxes. This is the enormous cake monster boss for GlobalMS's third and fourth anniversary event. Spawned in most towns and drops the level 64 maple weapons. Able to summon Anniversary Cakes. Looks somewhat like the NooNoo snowman boss from Christmas. A Flyeye with a festive Santa hat on, which looks rather odd perched atop its eerie single eye. This is the strongest form, and it appears in the "Hard" version of the Christmas Party Quest in Happyville. The Jr. Yeti's larger form. It retains its fire weakness and adds an earthquake attack. An event monster from TaiwanMS. The Coketump took the same idea as the Pepes and mounted the Yeti. The most powerful monster found in KMS's Coke Town. A boss for the Halloween Events in JMS. It is based on the Lich, a bot-catching monster in the Zombie maps. The biggest snowman of all. No matter your damage, you will always hit 10 on this. This orange fish is an invincible monster that only appears on screen for a few seconds at a time. You must catch it using the nets supplied by Gaga when it jumps out of the water. By doing this, one can earn special beach sandals or scrolls for those sandals. The Piranhas from Spiegameman's minigame resemble P Junior. A monster from ChinaMS Dragon Boat Festival event. You must catch it by using some item, similar to the method used to catch a Tamable Pig, in order to finish the event quest. It looks like a Shark but with gray skin instead of blue skin. A monster in the TWMS's Anniversary maps. There is a lot of cakes and cake monsters in maps. It can only be harmed by normal attacks. It is based off GMS's Anniversary Cake. The Young girl of the family that moved into the Pendergast Mansion in 2009. Fought as part of a PQ at the end of Haunted House II quest chain. She can cause darkness, rain down pictures all over the map, summon possessed toys, zombify you and uncommonly do 1/1. She drops cursed dolls that can be traded in for a chair resembling this possessed form. A crazed person who seeks to destroy Happyville and Christmas altogether. Has a disturbing resemblance to the friendly O-Pongo, 2007's Versalmas mascot, albeit much thinner and angrier. It can recover around 10,000 HP and can seal, but it doesn't appear to be much of a threat. Serves as the boss of the Christmas Party Quest's hard mode. The fake version of Griffey from Leafre. It's one of the strongest fake bosses. The fake version of Manon from Leafre. It's one of the strongest fake bosses. The enormous cake boss for MapleSEA's third anniversary. It far less HP and is generally much weaker than the Big Puff Daddy in GlobalMS. Unlike the free spawning boss in GMS, this version can only be summoned by Aramia in Henesys Park. Has identical stats to those of Fake Manon and Fake Griffey. This. Like the real Papulatus, it flies around. But since the maps Fake Papulatus spawns in are big, it usually flies up to the top, making it annoyingly hard to kill. Archers that are attempting to solo it won't have a problem, since they can use puppet to keep it near the floor. Nevertheless, this is the most hunted fake boss due to its EXP. During the GlobalMS Christmas event in 2006 and 2007, all Buffy were turned turned half red and green. An invincible guard found at the top of the beanstalk. If you touch it, you'll be "thrown out of Heaven", so you have to be careful not to walk into it while hunting the Gold Egg laying Pigmy. An invincible guard found in the Guy Fawkes Party Quest (Mal Volence Party Quest in GlobalMS). Possesses an attack that heavily knocks players back which can be used as their advantage to reach seemingly unreachable places in the Party Quest. A witch cat from an event. A witch cat from an event as above. Throws cookies as an attack. Looks like a nest of cats. 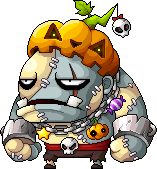 The first enemy you must defeat in the Halloween Hero's Gauntlet. The level and stats change depending on your level. Running into this will instantly kill you. The second enemy you must defeat in the Halloween Hero's Gauntlet. The level and stats change depending on your level. Running into this will instantly kill you. The third enemy you must defeat in the Halloween Hero's Gauntlet. The level and stats change depending on your level. Running into this will instantly kill you. 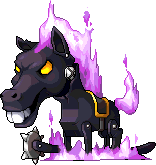 The fourth enemy you must defeat in the Halloween Hero's Gauntlet, after the trick platforms. It can launch bats out of its mouth, and drop a pumpkin on you. The level and stats change depending on your level. Running into this will instantly kill you. The final enemy you must defeat in the Halloween Hero's Gauntlet. Appears for whoever is on the top of the Hero's Gauntlet. The level and stats change depending on your level. Running into this will instantly kill you. Involved in a Maple Castle quest where you have to collect Failed Test Papers that they drop. The level and stats change depending on your level. Involved in a Maple Castle quest where you have to collect Party Outfit Boxes that they drop. The level and stats change depending on your level. Involved in a Maple Castle quest where it must be defeated. The level and stats change depending on your level. It has an attack that uses a whisk. Involved in a Maple Castle quest where you have to collect a Ghastly Purple Letter that they drop. The level and stats change depending on your level. Appears during the Mega Creamy Ghost expedition. The level and stats change depending on the average level of the group. It has an attack that uses a whisk. Note: The stats of the monsters change depending on your level. Appears in the Ruined Classroom of Red Leaf High. Must be defeated for Mr. Orlov's quest. Appears in the Home Ec. Room of Red Leaf High. Must be defeated for Bellflower Dude's quest. Appears in the Gymnasium of Red Leaf High. Must be defeated to protect the Four Pillars of Heaven. One of the Four Pillars of Heaven in Red Leaf High. Must be protected from Assassins in the Gymnasium. One of the Four Pillars of Heaven in Red Leaf High. Randomly appears in the Custodian Closet, and on the School Roof, with more HP. The version on the roof must be defeated for a quest from Shoon. One of the Four Pillars of Heaven in Red Leaf High. Randomly appears in the Custodian Closet, and on the School Roof, with more HP. The version on the roof must be defeated for a quest from Mumzy. One of the Four Pillars of Heaven in Red Leaf High. Randomly appears in the Custodian Closet, and on the School Roof, with more HP. The version on the roof must be defeated for a quest from So Roon. One of the Four Pillars of Heaven in Red Leaf High. Randomly appears in the Custodian Closet, and on the School Roof, with more HP. The version on the roof must be defeated for a quest from Boo. One of the nurses in the School Infirmary. Must be avoided to pass the stage. A Phantom can steal their invincibility with Vol D'Ame. Familiars can also damage these. The homeroom teacher of Red Leaf High, found in the Career Counseling room. The Dark Lord, randomly found in the Principal's Office of Red Leaf High. Grendel the Really Old, randomly found in the Principal's Office of Red Leaf High. Mu Gong, randomly found in the Principal's Office of Red Leaf High. Dances with Balrog, the physics teacher of Red Leaf High. Found in the Science Lab. Athena Pierce, the history teacher of Red Leaf High. Found in the Science Lab. Kyrin, a teacher from a rival high school who attempts to transfer you to Nautilus Marine High School. Found in the Empty Classroom of Red Leaf High. The captain of the judo club, who challenges you to a battle. Found in the Judo Dojo of Red Leaf High. Looks like Scarred Bear and has the same attacks, but additionally it jumps. The drum major of the school's band, who asks you to battle him as an entrance test. Found in the Band Hall of Red Leaf High. Looks like Spirit of Rock and has the same attacks, but additionally it jumps. Dual Blade, challenging you to a fight. He can use Sudden Raid, Blade Fury, which can super knockback, and Phantom Blow, which can hit 8 times, so be careful of that, since it can kill most jobs. Cannoneer, challenging you to a fight. He can use Pirate Spirit, which raises his Weapon Defense, Cannon Bazooka, which can stun for 1 second, and Cannon Barrage. Mihile, challenging you to a fight. He can use Roiling Soul, which gives him Weapon Cancel, Radiant Buster, which can super knockback, and Four-Point Assault, which can hit 4 times, so be careful of that, since it can kill most jobs. Oz, challenging you to a fight. She can use Fire Strike, Meteor Shower, which can stun for 1 second, and Flame Gear, which can hit 6 times, so be careful of that, since it can kill most jobs. Irena, challenging you to a fight. She can use Storm Break, which can super knockback, Wind Pierce, and Arrow Rain. Eckhart, challenging you to a fight. He can cast a recolored version of Vampire to reduce your visibility, and can use Avenger and Vampire. Hawkeye, challenging you to a fight. He can use Corkscrew Blow, which can hit 2 times, Energy Buster, and Sharkwave. Female Aran, challenging you to a fight. She can use Final Blow, Rolling Spin, which can super knockback, and Combo Judgment, which can stun for 1 second. Female Evan, challenging you to a fight. She can cast Killer Wings to seal your skills, Phantom Imprint to reduce your accuracy, and can use Dragon Thrust. Mercedes, challenging you to a fight. She can use Ishtar's Ring, which can super knockback, Stunning Strikes, and Lightning Edge. Phantom, challenging you to a fight. He can use Tempest, which can super knockback, Mille Aiguilles, and Penombre. Luminous, challenging you to a fight. He can use Reflection, Apocalypse, and Ender. Kaiser, challenging you to a fight. He can use Dragon Barrage, which can super knockback, Dragon Slash, and Gigas Wave, which can hit 3 times, so be careful of that, since it can kill most jobs. Angelic Buster, challenging you to a fight. She can use Heavenly Crash, which can stun for 1 second, Celestial Roar, which can super knockback, and Soul Resonance. Demon Slayer, challenging you to a fight. He can use Leech Aura, which gives him Weapon Cancel, Demon Cry, and Demon Impact. A Battle Mage, challenging you to a fight. He can use Twister Spin, which can super knockback, Dark Shock, and Dark Genesis. A Wild Hunter, challenging you to a fight. She can use Wild Arrow Blast, which can super knockback, Sonic Roar, which can stun for 1 second, and Exploding Arrows. A Mechanic, challenging you to a fight. He can use Atomic Hammer, which can stun for 1 second, Punch Launcher, and Laser Blast. Hayato, challenging you to a fight. He can use Fuu Sanrenzan, which can super knockback, Falcon Dive, which can stun for 1 second, and Tornado Blade. Kanna, challenging you to a fight. He can use Vanquisher's Charm, which can super knockback, Rock Yaksha, which can stun for 1 second, and Shikigami Charm. This page was last edited on 7 January 2019, at 21:02. This page has been accessed 208,860 times.